How to confirm events (and prevent incessant reminder emails from yours truly). Confirming events not only ensures that you're invoiced correctly, but also limits the number of follow-up emails you'll receive from us. It's vital that you confirm whether or not each Venuemob event enquiry you receive ends up getting booked at your venue. Why? We check with the customer too, and we need to confirm with you in order to invoice you correctly. 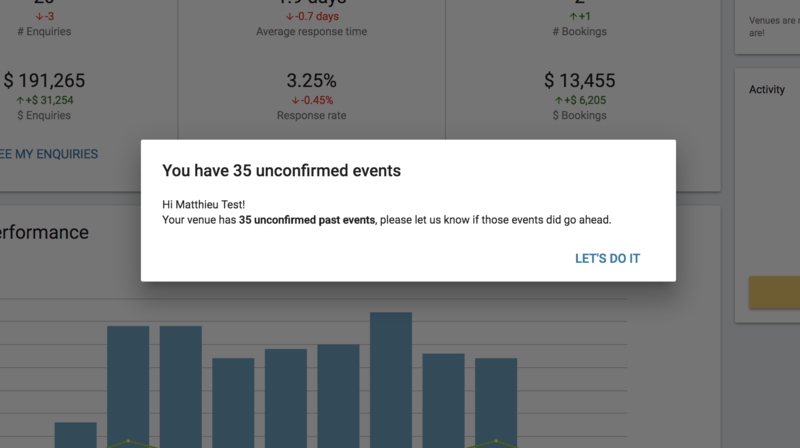 Upon logging in, you'll see a pop-up with a count of how many outstanding events are attached to your venue. 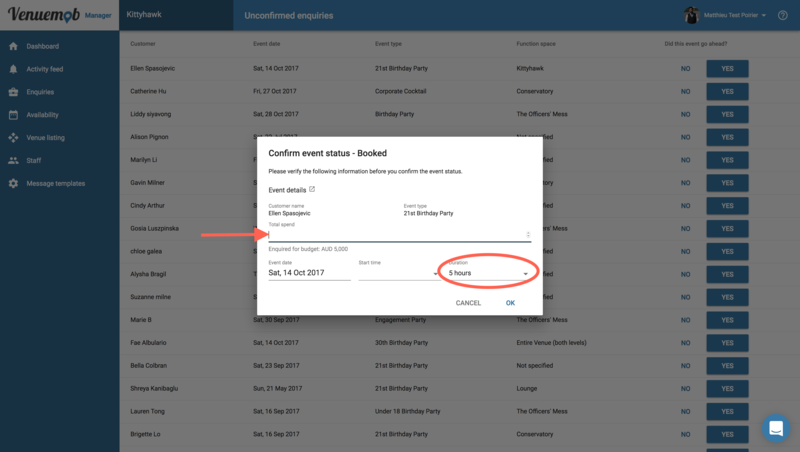 Click through to see all events in a list – then it's simply a matter of marking 'Yes' or 'No' to whether that event went ahead. Remember, we check with the customer too. If the event did go ahead, we'll need confirmation of the spend, and the total number of attendees. This is how we invoice you! If you don't confirm your events, you'll see a 'nag' on every page of Venuemob Manager. Just click 'Let's do it' to confirm your events. You'll continue to receive emails prompting you to confirm each event (if it hasn't already been marked in Venuemob Manager as booked or not booked) after the event date. Update the event's status, stop receiving confirmation email reminders. Simple. Invoicing dispute? Find out more here.